At the core of our dental practice is a friendly team of professionals that are dedicated to your utmost comfort and optimal oral health. We view each patient as a unique individual, and tailor each treatment to your specific needs. As part of our commitment to providing close, personalized attention to every patient, we want to encourage patient communication. Please know that we are here to provide outstanding patient care, and that we value the trust you have placed in us. In addition, you can find helpful information at Mouth Healthy. At Lonsdale Family Dental, we have three assistants, Mary Kay, Jenny, and Shannon, working with our doctors to ensure the highest quality care for our patients. We strive to make every patient's experience as comfortable as possible. Our assistants are responsible for preparing the operatories for dental procedures, assisting the dentists, taking impressions, and x-rays. Some of our expanded functions include placing sealants and assisting in orthodontic treatments. When not assisting the doctors, we assist our hygienists and business staff as needed. We are an important part of our dental support team in helping educate our patients and coordinate care. 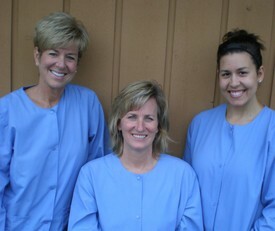 Our hygiene department at Lonsdale Family Dental consists of Amy, Lucy, and Beth with over 42 years of combined experience! Treatment provided varies from introducing a child to the dental environment to advanced periodontal therapy. We work with you to aid in your preventive dental care. Our hygienists work closely with our doctors and other staff members to provide an all encompassing treatment plan. We are friendly and willing to help you with any dental concerns. We are your first step into a caring dental experience at Lonsdale Family Dental. Lonsdale Family Dental's professional and knowledgeable business staff will assist you with all of your scheduling, insurance, and financial questions. We are always ready to greet you with a smile. We accept many insurance plans and gladly submit your services to them for payment. If there is a balance due after insurance pays, we will mail you a statement from which to pay. We accept cash, personal checks, and major credit cards for payments. For our patients without dental insurance, payment is due at the time services are rendered. We are happy to work with our doctors, hygienists, and assistants to make sure that all phases of your dental experience are pleasant, including the financial aspect.